In this blog post we share a few ways you can create beautiful outdoor room. It is all in the detail - fences, sheds, flowers, lighting and raised beds all can make a dramatic impact in your garden. In this blog post we share a few ways you can create a beautiful outdoor room. Lush, colourful planting is the perfect way to add visual impact to your garden. Using colourful plants adds interest; and by paying close attention to colour you can up the ante and create a real impact. Flowers, berries, fruit, leaves and bark can all be contributors in creating patterns, contrast and variety. Use softer colours and finer leaf textures to create a sense of relaxation and elegance. Ornamental grasses and Bamboo, among other perennials and shrubs are perfect for adding structure. If you do not have space for flowerbeds in your small or courtyard garden why not invest in a timber raised bed You can grow a colourful flower garden in minimum space. Use height when planting to create a visual, vertical garden. Vertical garden design utilises growing space and can substantially increase your planting area – a perfect for solution for smaller, compact gardens. Climbing plants and wall shrubs cover walls, unsightly features, arches and pergolas. True climbing plants take up little ground space and are excellent choices for smaller gardens, whereas wall shrubs do require more ground space. Popular plants are: Clematis, Roses, Wisteria and Honeysuckle. Stick, poles, mesh and fencing all serve the purpose of coaxing your plants upwards, trellis fencing is perfect for creating a screen or feature structure in your garden and it is also ideal for climbing plants. A garden shelter not only extends the use of your garden by protecting you from the elements, it can also add an interesting visual element. Our Curve garden shelter is a sleek and simple structure – one continuous curve that arches gracefully from the ground. Installed either as a stand-alone structure or as an extension of your home. The use of paving in your garden not only can provide a practical function, but also visual appeal. Colours, textures and sizes – brick, blocks, flags and slabs can all be used to create a dramatic visual impact. Traditionally used to mark your boundary, your garden fencing can now offer so much more. From natural to contemporary, in a choice of heights and styles your fencing can compliment your garden and enhance your surroundings. If your garden is dark or small the solution may be semi-solid panels. These not only add a visual appeal, the gaps allow in light and wind to pass creating light and airy gardens. If your looking to add a little more visual impact to your garden, why not take a look at our Pinterest account, where we pin inspirational and achievable ideas for your garden. Anna joined the sales department at Jacksons in 2005 and in 2006 was promoted to Retail Sales Manager. 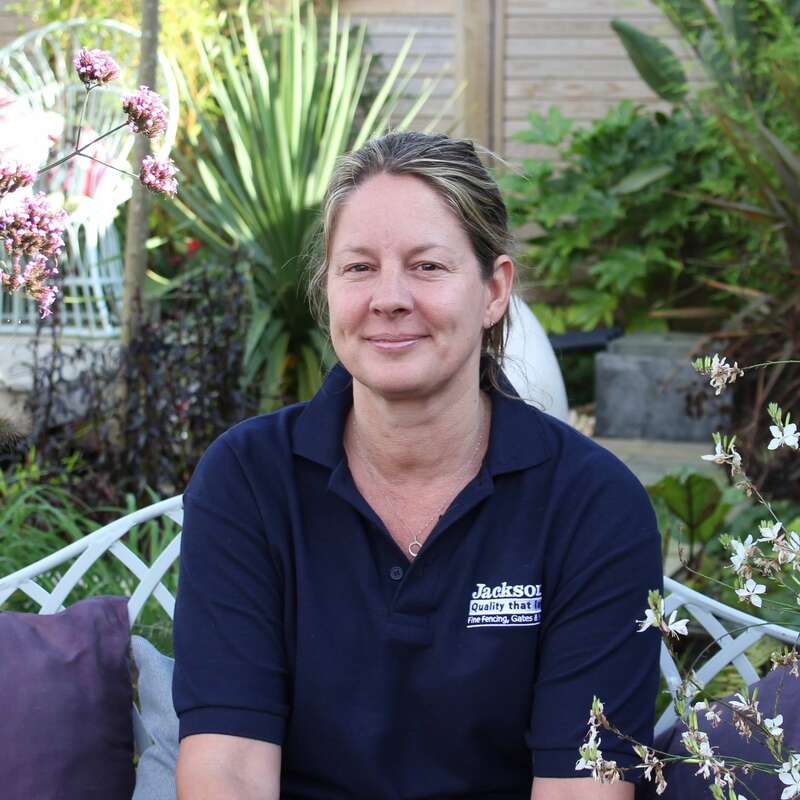 Day to day Anna manages our biggest retail accounts, oversees the retail sales team at our Ashford HQ, as well as specialising in a number of sectors especially Equestrian.